An accordionist from Jedburgh in the Scottish Borders, Jamie is currently based in Kirkwall whilst studying a degree in Applied Music through UHI. His varied style is based in traditional Scottish music; a love passed down from his father, Ian, an established folk musician. 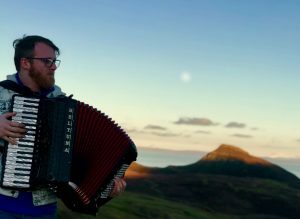 Having spent the last year immersed in Orkney’s local session scene, and performing alongside accordionist James Grieve, this is Jamie’s Orkney Folk Festival debut.